There won't be a line to kill the big bad guy. Speaking with Game Informer about the recently-unveiled Elder Scrolls Online, creative director Matt Firor said that the developers wanted to make the player feel like the hero they were in the single-player games. "You're always the hero, whether you want [to be] or not," he said. "You go out there and kill the dragons. You defeat Mehrunes Dagon in Oblivion. In Morrowind you're up there fighting the Tribunal." "Those are huge, global, epic things that you don't want to stand in line to do in an MMO," he said. "The last thing you want to do is to have the final confrontation with Mehrunes Dagon as he's stomping across the Imperial City, and you see 15 guys behind you waiting to kill him because they're on the same quest." The TES Online designers were hoping to hit that feeling of "You're awesome, you're the hero" through technology, letting players confront the games' major villains in instanced areas by themselves (or, presumably, with friends). "We have a whole part of the game that's 100% solo, which is the main story," he said, which would let players be the hero and see the world react to them. 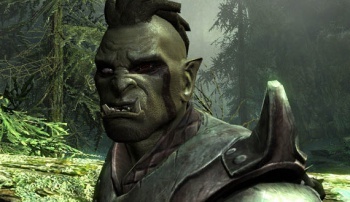 Firor said that the team didn't want the game to fall into MMO conventions - where if you're adventuring in a new area and you see a ruined tower to the left and a town in front of you, you go to the town first so you can get the quests that will eventually take you to the ruined tower. "To me, that's dumb," he said. "In The Elder Scrolls games, if you see something interesting, you go over there and you find something to do ... you get something to do right there, you get rewarded, and then you can go to the town." "You don't have to do things in a certain order. You can go to the tower, and then you might see an interesting camp of bandits in the distance, so you go there and you have something else to do." I can appreciate Firor's sentiment, but I do think that if players want content that's "100% solo," the MMO genre may not be for them. Check out the full interview, including thoughts on The Elder Scrolls Online's endgame and raiding, over at Game Informer.